Emily and Justin are a beautiful couple both inside and out. Here’s a bit of their wonderful story. When we first met them and heard the story about how they dated long distance, talking every day via Skype, we knew the rest of their wonderful story was going to be awesome. In Emily’s words… Justin and I officially met our freshman year in college when my family moved to Virginia Beach. Our dads were working at the same church so our families were around each other a lot but I was living several hours away for school so we never got to know more than each others names. My senior year in college, Justin transferred to Liberty! I was supposed to be leading worship for my grandparents Sunday school class but for some reason, my usual guitar players were all out of town! I frantically asked around and a mutual friend mentioned that Justin played guitar. So I reached out, and we met up a few days later to practice. What should have been a thirty minute practice session turned into a couple hour conversation and when we left that night we both knew this could be a pretty special friendship. We hung out on and off that semester and began dating in November! About 4 months after I got home, Justin proposed and obviously the rest is history! 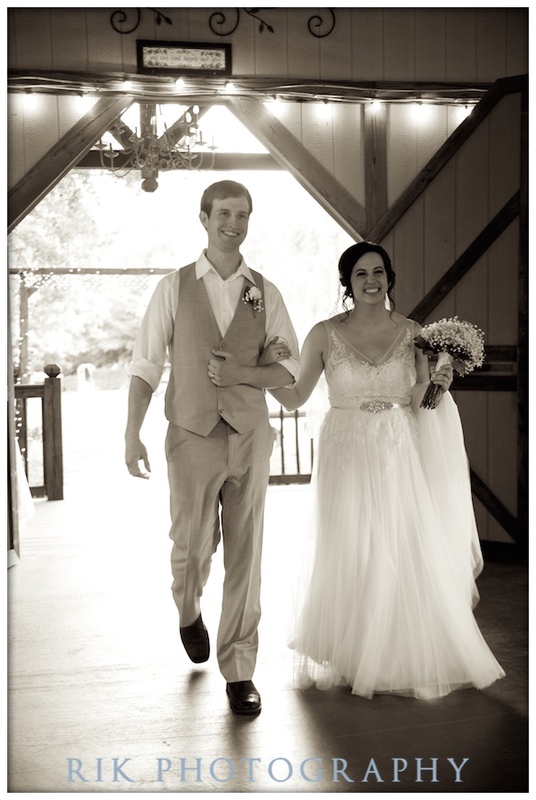 We were so happy to share this wonderful story with our blog followers and the Bluff Mountain Inn staff was thrilled to be working with this beautiful couple. We wish them the very best blessings in their life together. 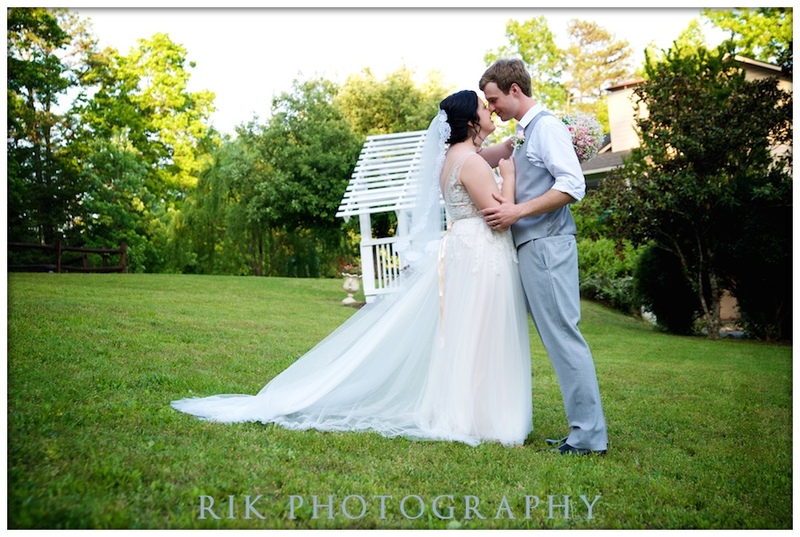 See more images from this wedding on the RIK Photography Facebook Page! 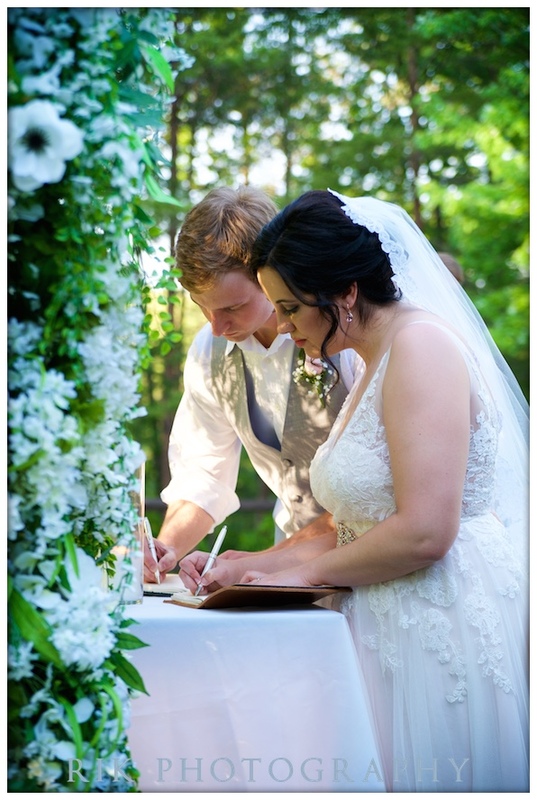 One of Gatlinburg’s top floral designers talks about wedding flowers. What can you learn about wedding flowers by talking to one of Gatlinburg’s top floral designers? Quite a bit. Gaynell Weeks has spent most of her life creating floral designs for brides, wedding venues, hotels and commercial events. If you’re planning a wedding Flowers of Gatlinburg is one of the top shops in the Smoky Mountains. Their creations are always stunning. Bride standing in front of a barn in winter wedding attire. A couple of days ago I stopped by to ask her a few questions I thought might be helpful to our clients. 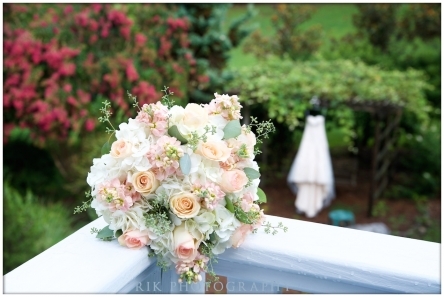 For a spring what wedding flowers would you suggest? Tulips, dehlias, ranunculus, hydrangeas.. there aren’t really many flowers that can’t be ordered in the spring. Pretty much the same except for peonies. We can get them in the summer but they’re much more expensive because they have to be ordered from either Canada or Holland. Also garden roses can be expensive because they’re grown by specialty growers. They’re in high demand because of their popularity on Pinterest. But your average everyday flowers like carnations, callas, iris, daisies, astilbe can be ordered about anytime. If you want fresh succulents or lavender we just need more notice to get them. What about fall and winter weddings? Just about anything except for peonies. Those are about the only popular wedding flowers you can’t get year round now. So if a bride comes in and just wants a beautiful bouquet what would you tell her? I’d advise her to use a mixture of hydrangeas, roses, gerber daisies, tulips; just whatever their favorite flower is. Orchids take a special order and more time. Gardenias are very fragile and sometimes won’t make it through the day. Same with lilies of the valley. I’d stay away from those. We just need to know what the colors are and then their favorite flowers. I advise brides to choose their colors early and the best first step is to pick out the bridesmaids’ dresses and buy them. Sometime you might pick the dresses for the bridesmaids but the style and size you can’t get so that will affect the colors for the wedding. So it’s best to contact the florist after you get those dresses. Tell me about different kinds of wraps for bouquets? These days with shabby chic in style it could be burlap or twine but typically the bridesmaids bouquets are wrapped in the color of the dress. The bride’s dress (typically) will be white or cream and I suggest they use the same color as the dress. How did you learn so much about wedding flowers? I’ve done just about everything in decorating and flowers. I have been doing everything in a flower shop for over 40 years; weddings,outdoor weddings, tent weddings, decorating malls and department stores for Christmas. We did the Backstreet Boy’s manager’s wedding at the Four Seasons in Atlanta. Also some really big weddings at the Art Institute. We’ve hung flowers from tent poles, strung tule with lights in it climbing ladders all the time… the reason I love Gatlinburg so much is because the wedding venues take care of all that so we can just concentrate on the flowers. Any words of wisdom for a bride on picking out her flowers before the wedding? 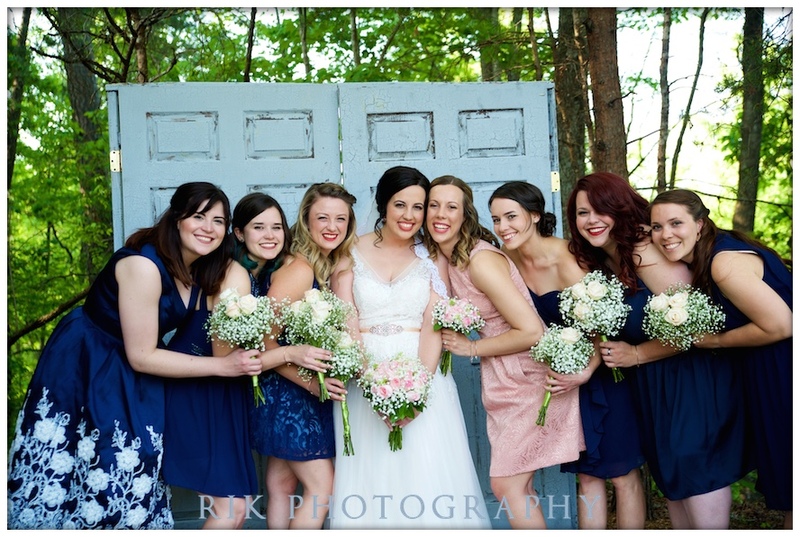 Just make sure you get your colors right before you get with the florist or get a good wedding coordinator or find a great all-inclusive venue like Bluff Mountain Inn where they take care of everything for you. 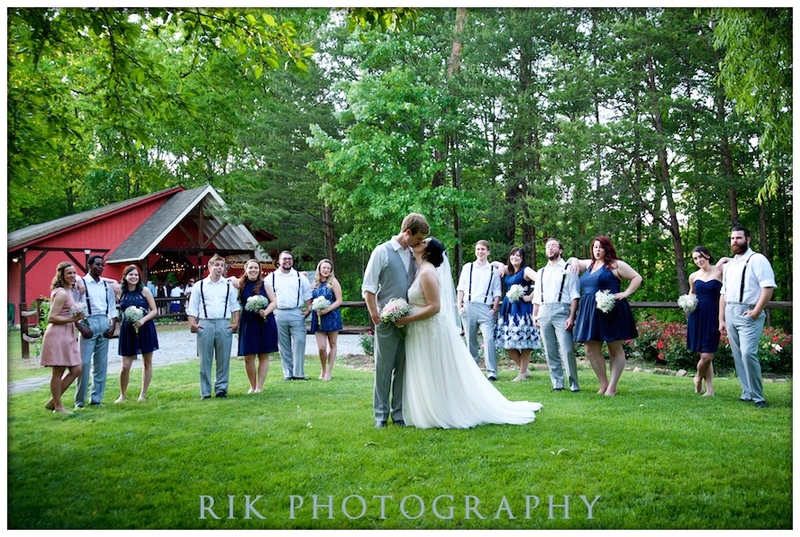 Real Gatlinburg Wedding: Sara and Barker Got Married in The Mountains! 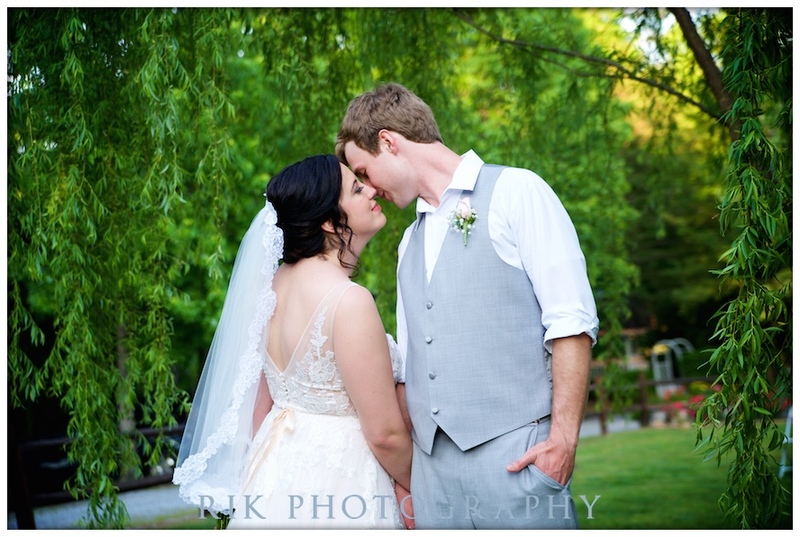 Sara and Barker got Married in the Mountains near Gatlinburg. When they were married it was a great day for a great couple and their families and friends. 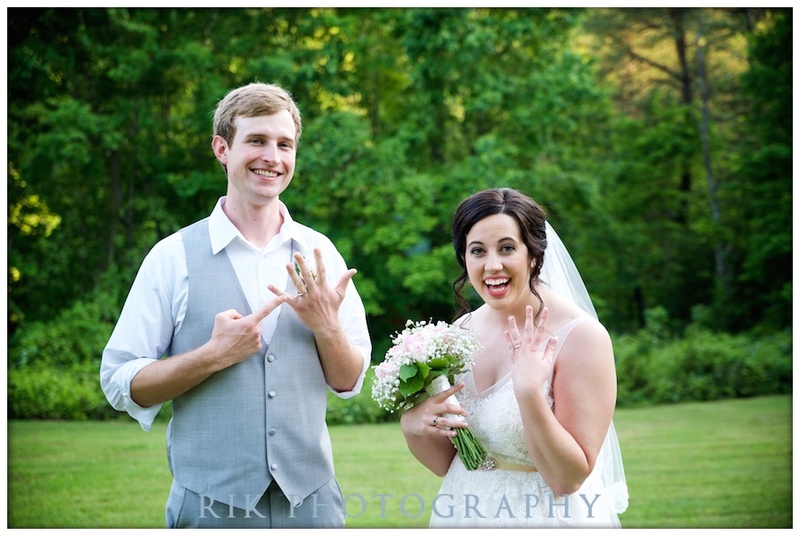 We’re excited to share some of the photos of this real mountain wedding here. 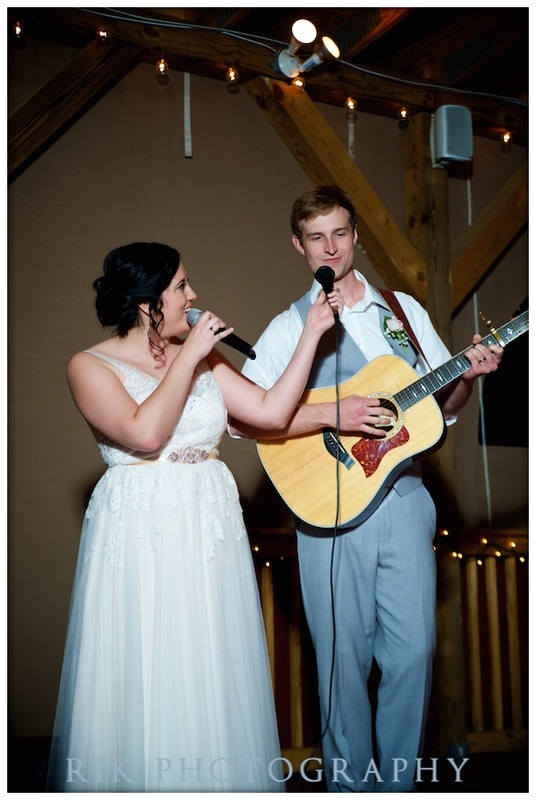 “We met in kindergarten when he had my mom as a teacher, and then when we met and actually started “talking” and liking each other it was in Walmart haha. Our first date was to Riverbend to see Sam Hunt and then to steak and shake and I wanted to kiss him so bad but he didn’t and I got worried. 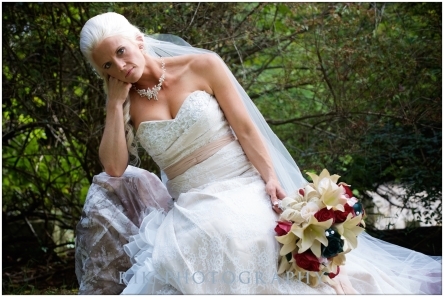 Sara’s bouquet was designed by Gaynell at Flowers of Gatlinburg. She’s a real artist with flowers. Barker was hiding behind the tree when Sarah walked down the stairs. While we distracted her by taking photos he walked up and surprised her from behind. You can see the love between these two just in the way they are around each other. Ring ceremony at their wedding. They got married in the mountains alright! The happy couple walking down the aisle following the wedding ceremony. Bride and groom photos following the ceremony. A sweet kiss on the forehead with Bluff Mountain in the background. A perfect wedding day. 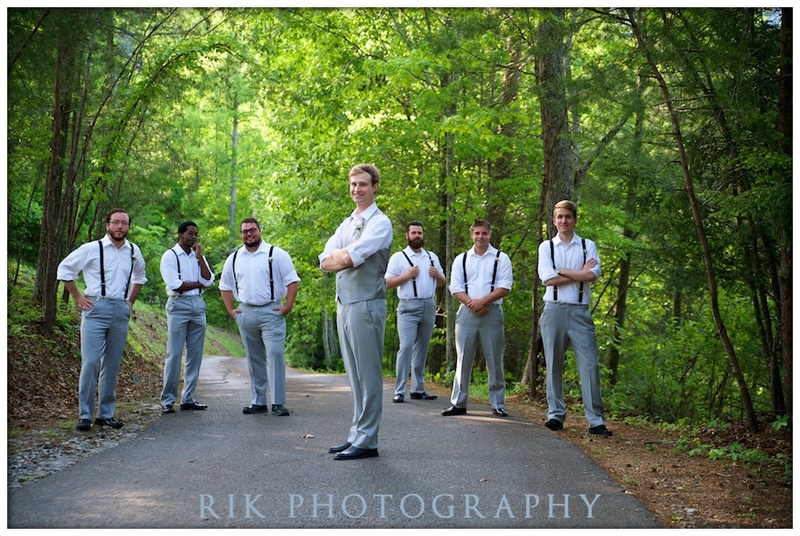 Barker and his groomsmen pose for a photo on the fence by the barn. Great bunch of guys. Big wedding party for this wedding in the Smokies. The yellow really made the photos pop! 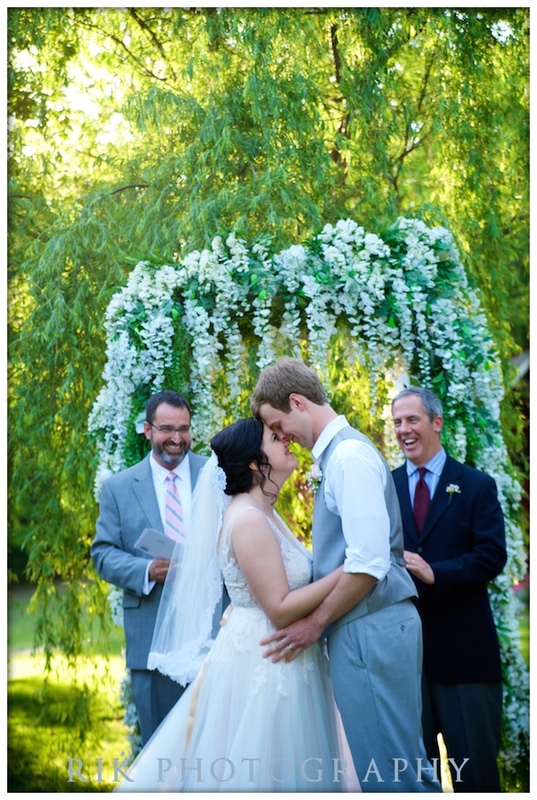 A fun candid shot while catching some cool photos of the bridal party. 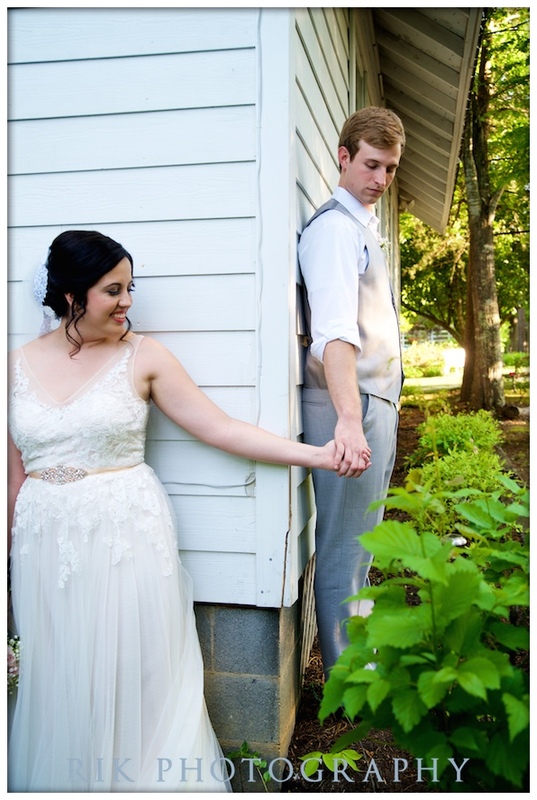 Sara and Barker had a lot of fun with the bride and groom photo session. Another romantic pose in the mountains. 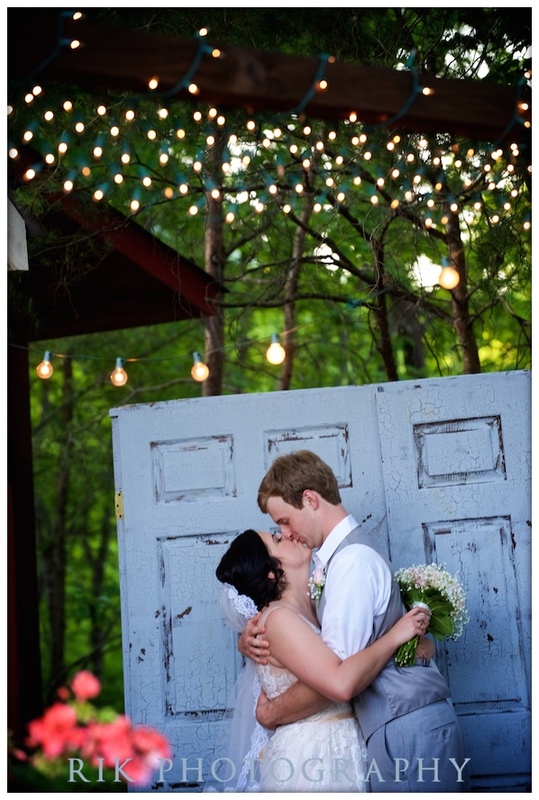 Wanting something special for this couple, we had special decorations hung by Campbell’s Party Rental. Table decorations by the Bluff Mountain Inn Wedding team. The reception was in the Garden Reception room. A gorgeous wedding cake provided by Confectionista’s Kitchen in Seymour, TN. 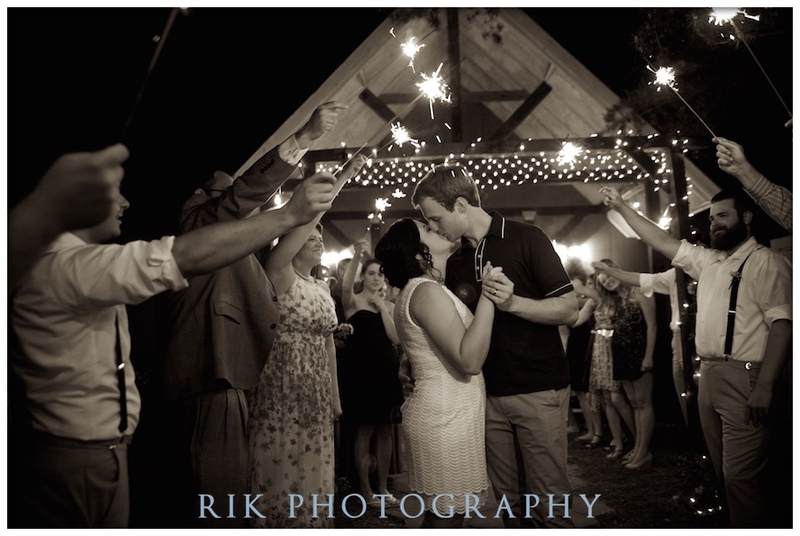 Sara and Barker’s first dance as a married couple. Having a little fun experimenting with sparkler art in front of the chapel. Sara’s dad proposing a toast to the happy couple on their wedding day. Congratulations to Sara, Barker and their great group of friends and family. They’ve now been happily married for few weeks! Cheers!!! 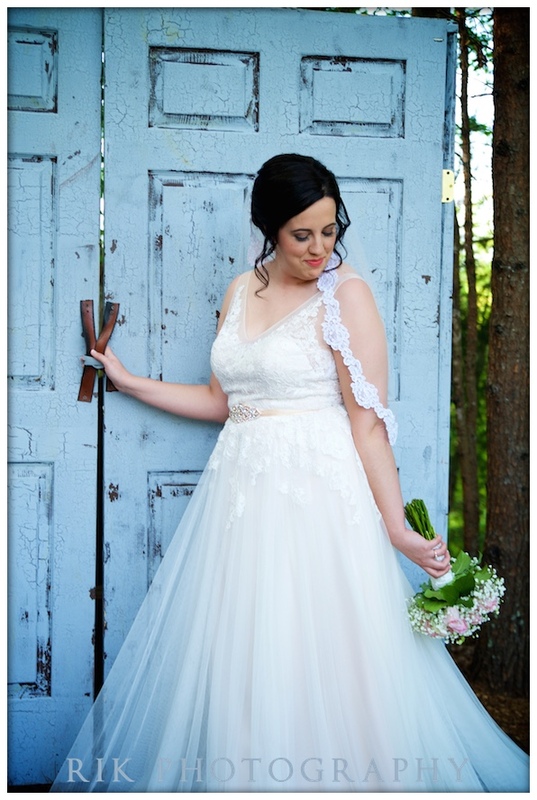 Call 865.908.0321 today to talk about how you could have a beautiful mountain wedding! If your wedding is going to have a unique theme, let the wedding photographer know! This way they can do their homework to come up with some one-of-a-kind portraits. It is a great idea to bring some props that matches your personalities. Timing is very important on wedding day. It is a great idea to let your photographer know what time your hair and make up start and end, the time guests start to arrive, etc. This will help the photographer strategically plan their day for portraits and family photos. You have more than likely chosen this particular photographer because you love their style, but it doesn’t hurt to give them some of your ideas. Photographers are more than happy make your ideas pop with their own creative style. Sometimes photographers are even willing to go off-site to get that cool shot you want so badly! Let the photographer know what family and friends will be there; and also what specific family members and friends you want photos with. This will help them map out the style and time for family portraits. Sometimes with the broad family dynamics, some people chose to not have their photo taken with others. It is a good idea to let the photographer know ahead a time to avoid any awkward situations when calling family up for photos. 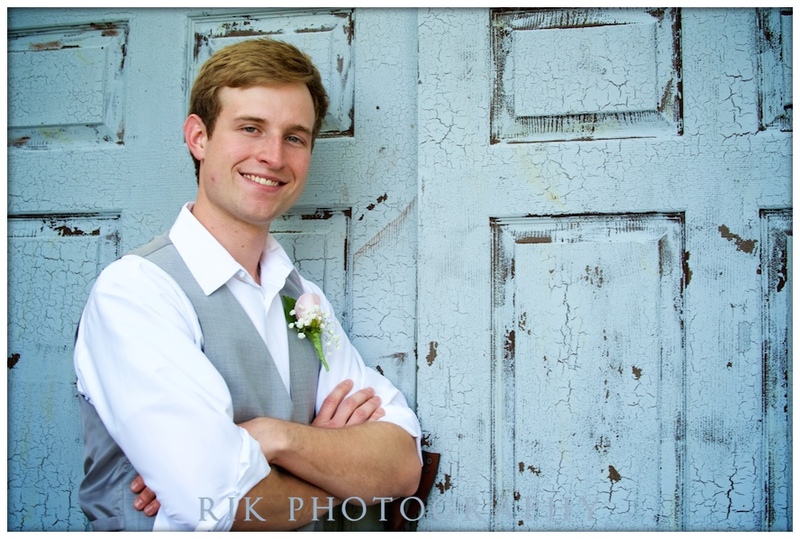 Better yet, have a list of family photo combinations for your photographer. 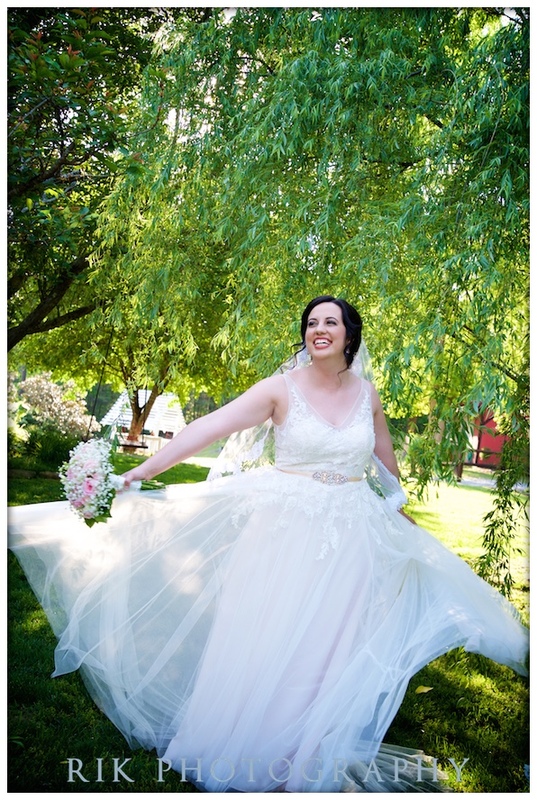 More than likely, your professional photographer has a couple of packages to choose from. This topic of conversation is also a good time to ask about the rights to the photos and to find out where some of the best photo labs are. You will probably have to sign a contract with the photographer, but this is to not only protect the photographer, but you as well! 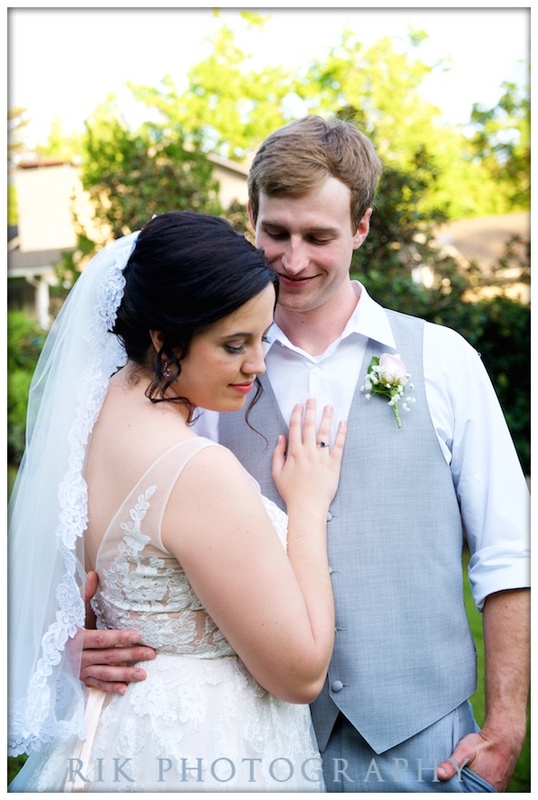 Now that you have discussed your wedding day with the photographer, it is very important that you feel a connection with them. 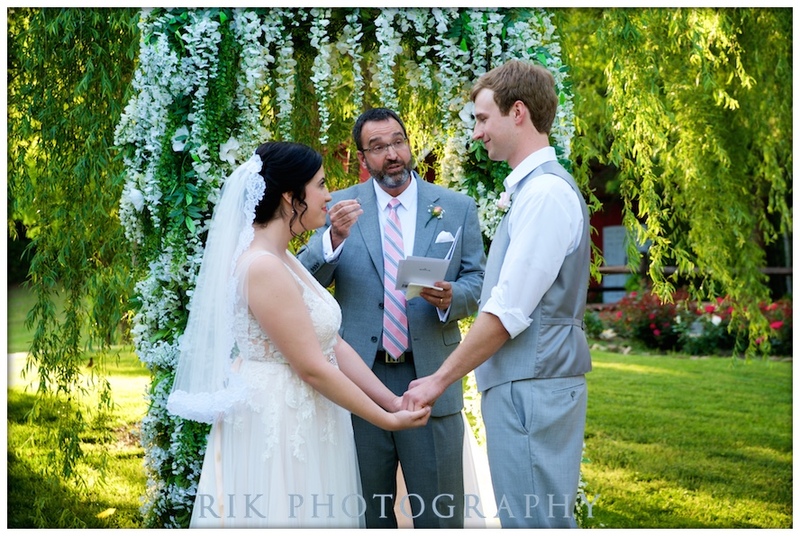 After all, you will be seeing the photographer more than any other vendor! Wedding Day can come with stresses and high emotions, but these pointers will help give you ideas to stay cool, calm and collected during your big day! 1. Choosing an all-inclusive wedding venue is one ideal way to keep the stress down. 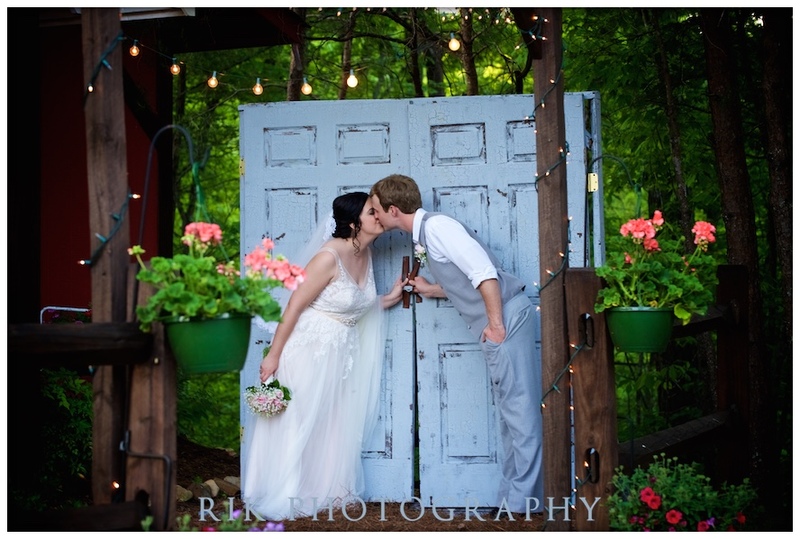 A venue like Bluff Mountain Inn takes care of everything from the planning to the decorating. Just describe your ideas of a dream wedding and let them handle the work of making it come to life! 2. It is known that exercise helps relieve stress, even if it is just a short walk. If you are feeling a little anxious, taking a short, 10-minute walk will help you gather your thoughts clearly and get your happy endorphins pumping to get you re-energized to walk down the aisle. And what better place to relieve some stress by walking outside and knowing you are in the beautiful Great Smoky Mountains!? 3. A DIY emergency kit! 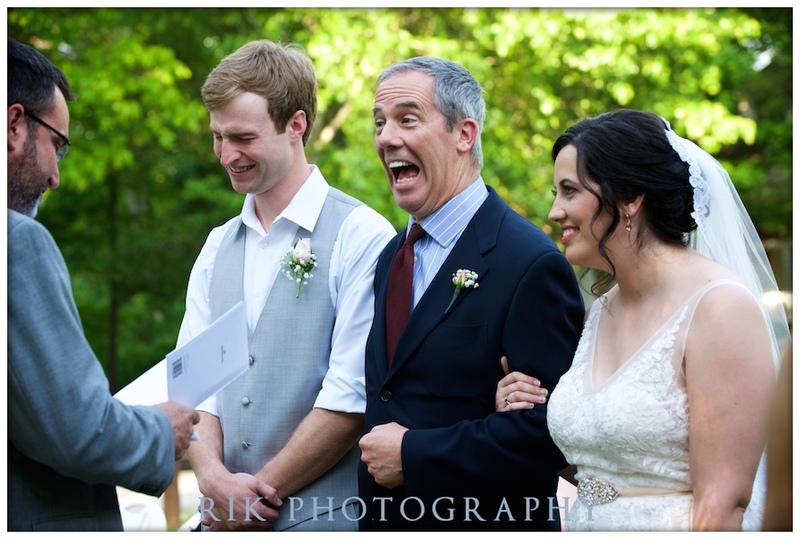 Sometimes the smallest mishaps seem dire on a wedding day. This kit can include things like a small sewing kit, stain remover pens, healthy snacks and water, bobby pins, hairspray, lint roller, aspirin, safety pins, etc. 4. Making last-minute decisions can raise the anxiety. Who is your biggest helper? Appoint them to help you make these decisions! Remember, it is always okay to ask for help. Also, if you have a wedding planner, put your trust in her that she will make your dream day as smooth as possible. After all, this is what she loves to do! 5. Taking care of yourself is key! A good night’s sleep will give you the energy to power through the day. Along with getting rest, eating is just as important! While you may be concerned with the fitting of your dress, eat a healthy and balanced breakfast (and even lunch!). It will keep the nerves down as well as maintaining that energy that you got from that beauty sleep. While the day may seem hectic (or crazy!) keeping cool and calm will help you enjoy the moment and give you many more memories to last a lifetime!